. :: GLOBAL CHAMPIONS TOUR OF FRANCE, CANNES 2010 ::. The GCT Grand Prix de Ville de Cannes was a contest to thrill any show jumping fan. Of the 18 horses that got through to the second round, 17 were clear and consequently it was anyone's Grand Prix when the riders returned to the ring. First to go double clear over the jumps was Filipe de Azevedo but sadly he fell victim to time and received one penalty for it. So almost inevitably it was Marcus Ehning on Plot Blue who started the ball rolling for the jump off. He was immediately matched by Kevin Staut on the wayward Le Prestige St Lois who on this occasion kept his bucking antics to a minimum. The number for the timed round rose to five when Jessica Kurten on Castle Forbes Libertina, Marco Kutscher on Cash and Edwina Alexander on Cevo Itot du Chateau joined them. Serge Houtmann's eight fence jump off course featured that most crowd pleasing feature; a very long gallop to the last, but both German riders did not need to take advantage having already had a pole down before that point. But Kevin Staut really set Le Prestige alight having wasted a little time bucking early but to a huge groan the last rail fell. Then Jessica Kurten galloped in and despite knowing a safe clear would leave her no worse than second, she sportingly gave the crowd the round they were waiting for but despite a herculean effort from her mare, she was too far off the last oxer to have any chance of leaving the back rail up and her time was a fraction slower than Kevin's. 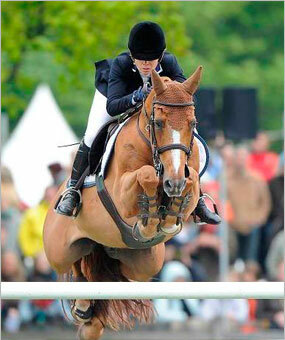 So Edwina Alexander on the smallest horse in the field knew she only had to jump clear to win. You could have heard a pin drop in the stadium. The audience were well aware that one mistake would hand the win to their favourite, but Itot du Chateau never looked in any danger of doing so and to their credit, the cheers and applaud could not have been more enthusiastic when the Australian's French bred horse cleared the final fence. "I was very sure Itot would be clear as he had been jumping so well but it wouldn't have mattered if I had four time faults instead so I could not go that slowly," commented the rider at the press conference. Earlier in the day Alvaro de Miranda Neto and AD Norson repeated their successful Turin performance when they won the Prix Nice-Matin speed class. Two weeks ago in Turin, the horse was placed twice before wining on the last day and he has done exactly the same here. Alvaro was still delighted, especially as he was third to go of 43 starters. “it is hard to know if you have done enough especially with so many good riders after you , you always think you might have left the door open but luckily today I didn't! This horse is just super consistent though.” Ireland Denis Lynch was second on his recent acquisition Lacroix and Harrie Smolders was third on another GCT speed specialist Exquis Powerfee, who won two similar classes at Monaco in 2009.